In today’s training I’m going to dig into the topic, the concern, the issue of trying to choose a niche if you’re just getting started. I think for most of you, it’s trying to choose an angle within your niche. We could call that a sub-niche, we could call that an angle, or a deeper angle within your niche. The reason that I’m doing this is … I frequently get the question “How do you choose a profitable niche?”, “How do you choose a profitable angle?”, “How do you choose a profitable part?” of the internet. I’ve always avoided teaching on this folks, because, I don’t believe that there’s any one-size-fits-all answer. It varies per person. It varies depending on the type of niche that you’re going to go into. And, it varies over time. And, so, when I do a training like this, I like it to be evergreen. I want it to be something that folks can use. I don’t want to create something that’s good for three weeks. I like to create something that is long term. And, yet, I get these questions a lot. So, what I’ve done is I’ve put some thought into exactly how I can position this so that it’s something that everyone can use, and that offers you the various options. Almost like branches on a tree. Gives you different options. If this won’t necessarily work, you can do this. I’ll present it to you in such a way that you’ll be able to see the thought behind it. Because the truth of the matter is, even though it’s very, very difficult, I’m going to try and do that today. It’s very, very difficult to give you, it’s certainly not a one-size-fits-all, but even a tree solution, where there’s 3 or 4 solutions, but there may still be a 5th or 6th solution. The truth of the matter is, if someone comes to me, and I do a private call with them, and I dig in, and I ask them a few questions, I can almost always, no matter what the niche is, I can almost always direct someone to a profitable corner of their niche. Really, just by asking a handful of questions and digging in. They’re going to be different for each person. But, really being able to dig in, I’m able to come up with that. And, so the more I think about it, I say well, if I can come up with it, and if I give you enough information, then you should have a starting point to be able to come up with it for yourself. Without further ado, let’s kind of dig into it. There are two different starting points when you choose a niche. 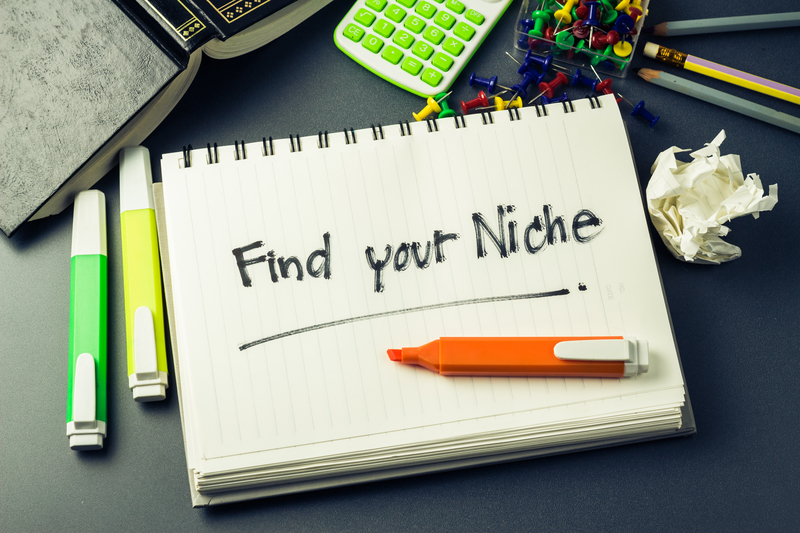 You may be looking for a niche or a sub-niche, or an angle in your niche, because you already have an interest in something. You have an interest, you know that that interest is something, well, it interests you. But, you don’t know what part of the business might be profitable. You don’t know what part of the business people are looking for information. One of the things it’s important for us to remember in this industry is, we can have the best information in the whole world, but if nobody is looking for that information, you’ll never sell any of it. I want you to just imagine that you’ve created a brand new recipe, for a new salad. But, it’s absolutely disgusting, and nobody would ever want to eat it, nobody would want to serve it. You could make that recipe, and you could put it online. You could make pictures of it. You could put a price on it. It may be a phenomenal recipe. But, nobody wants it. Because it tastes bad. Nobody is going to be looking for it online. So, you won’t have any buyers. When you’re in a position where you say, I have a particular interest. I want to be able to help people. I know there’s people out there who need help, but I don’t know exactly what they need help with. That’s what we’re kind of talking about right here. You have an interest, and you want to dig deeper. There’s another branch here. That is, you may be in this boat as you’re listening, you’ve got this idea that you want to get involved online, and all you want to do is make money. You don’t care what niche that you get involved in. All you want to do is make money. I would submit to you, that until you develop an interest. You’ll probably never make money. The problem is, that’s a rare occurrence. Like, maybe one in a million, or one in two million. The question is, you’re building your business right now. Do you want to take a one in a million shot? That you MIGHT be able to do something that will make you a full-time income. That might do really, really well. Or, do you want to be a part of a one in two shot, or one in three shot that you can build something solid? The thing is, if you’re going into the business just for the sake and the purpose of making money. With NO outside interest at all. That’s exactly what I believe you have. You’ve got a one in a million, or one in two million shot. Unless you’re willing to stake your family’s future, the other 999,999 slots on FAILURE. I think a lot of times when people hear odds like that, they’re like “Hey, one person did it! So, I can do it”. Hey, you’re right, you can do it. But, if 999,999 other people failed, in order for that ONE person to succeed. What we’re really talking about is a 99.9999% failure rate. My guess is, it’s not. In order for you to choose a niche where you’re going to make money … I believe … you’ve got to start with some interests. Throw the money aside … forget about the money … find places online where people have needs, real needs. Then work on filling those needs. As you’re filling those needs, you can then look for pockets of needs where people are willing to pay money. Because if people are willing to pay money, and there’s a lot of people that have that need, then you can make good money selling in that particular arena. But, if you just start from a position of making money, the odds are very, very slim. In either case, whether you’re looking for a niche, or a sub-niche. Looking for that best angle. Or, if, unfortunately, you’re in the place where, hey, I just want to make money, I’ve got 1 or 2 ideas of things I might be interested in. What I’m getting ready to share with you will give you kind of the road map to making that happen. The first thing that we have to do. We have to find out what are interests and needs that need to be met. We can brainstorm this, and by the way, rather than just giving you four different ways that you can do this. I want you to understand the why behind it. Because if you happen to be in a niche, or an interest, where the 3 or 4 ways I give you won’t work. If I give you the background for WHY you would use these, then you can find something that will work for you. The bottom line is, what you’ve got to do is find out 2 things. Number 1, are there people in your interest area that have needs that are being unmet? And then 2, are the people who have needs that are unmet, are they willing to invest money with you? You’ve got to find out both of those things. Folks have talked about in the past, and it’s a fallacy, that you can just go online, do some quick research, find out how many people have needs, find out how much money they’re willing to spend, and well, voila, you have your answer. I don’t know that it EVER worked, but, if it ever worked, it doesn’t work anymore. One of the old methods, and I think at one point I even taught an iteration of this, one of the old methods, when the internet was young. You would go online, and you would look for something that had lots of searches online, and it didn’t have too many advertisers. But, it had some. The theory was, if there were some advertisers, well some people must be making money. People don’t pay advertising if it’s not working in the long run. You might start out advertising, but after a few weeks, or a few months of not making money, they tend to quit. It just works that way. We could look at some old formulas, and we could say, hey, if people are advertising, and lots of people are asking the question, well then, somebody is making some money, so maybe there’s room for one more entrant. Let’s look at the root issue here. I want you to imagine that you’re thinking about opening up a restaurant in your town. The first place that you would go to find out if maybe you needed a new restaurant in your town is to look and see what’s happening with the restaurant scene. Are people filling up the seats in at least some of the restaurants downtown? Now, if some of the restaurants are empty, and some of them are full, that doesn’t tell you that there’s no more hungry people. If some of the restaurants are full, it tells you the food’s probably bad in those empty restaurants. But, if there’s a number of restaurants that are full, it probably indicates that there’s a demand for good food in your town. Okay, some restaurants are full, so there must be a demand. There are hungry people. You sit outside with the binoculars and you watch how many people are coming around. You sit outside, you’re downtown, you set up 100 yards away, 50 yards away, you set up your binoculars, or telescope, and you watch in 10 restaurants, and you just count how many people go into each restaurant. At the end of an hour you know 970 people have gone into those combined 10 restaurants. There are 970 hungry people on Friday night between 6 and 7. This is a fact! We know this now. We know that there’s that many hungry people, and there’s 10 restaurants. If you open a restaurant, and yours is as good as everybody else’s, you’ve got a shot at generating 1/11th of all of that business. You know this. Next you go granular. You say, ok, we know we’ve got 10 restaurants. 970 people. What if we sit somebody outside the door of every one of these restaurants. We hire 10 people to work maybe an hour. We just tick it off, how many people entered this door, how many people entered that door. And if you find that there’s a 97 person average on Friday night, some restaurants have maybe 300 people, some restaurants have only 5. What does this allow you to do? It allows you to realize those restaurants have better food, or food that people like. Maybe there’s a Chinese restaurant, and Indian restaurant, American restaurant, French restaurant, Italian restaurant. You may say, well, the Italian restaurant is getting more customers. The Chinese restaurants not getting as many customers. Then maybe you have to go sample the food. Is it good food, or is it bad food? The only way that you’re going to be able to get information about whether or not your niche is going to be profitable, and whether there’s needs, without actually selling in the niche is to do some research – some searching. In your niche. I gave you this illustration because offline is the illustration that we can all really relate to. This idea of how would we determine if there’s room for one more restaurant. You realize, offline, that you need to do the work. It’s the same online. Okay, here are a few articles on how you can do that work online, now that you understand how important it is! One of the lies online is how easy it is to build a new business. People believe that. They read sales letters and even watch late-night infomercials about how many new niches, new opportunities there are. That data is made up for the purpose of the infomercials and the sales pages. This “data” is everywhere and says you can figure all of this out, with no “boots on the ground”, in other words, with no work and without fully understanding what’s going on. I say this because so often when someone reads something about choosing a niche, or how to find out what your marketplace needs, you are looking for an easy formula. The truth of the matter is: there… is… no… easy… formula! Think about this example: there is no easy formula to figure out if you need a new restaurant in town. Let’s say you want to open up an Indonesian restaurant. And there are no Indonesian restaurants in your town. The only way that you’ll actually know if that restaurant will work would be to open one. Yes, it will cost you time commitment. But, the only way! That you’ll ever know, is if you physically open up shop. The only way is if you invest whatever it is. $100k for kitchen equipment, you hire a chef, you paint the front door, and you open the doors. Once the doors are open, you can start counting heads. You can look at all the business that everybody else is doing, but you’ll never know what your brand new Indonesian restaurant is going to do, until you open it. One more idea here: could you open up a road-side stand, with some Indonesian food, and park it in front of the empty building where you want to put your Indonesian restaurant, and try it out for a week or two? Just see how much interest there is. It’s still not going to prove your idea, even if you sell 1k plates from that roadside stand. It’s still not going to prove that the restaurant will do well. Hey, maybe people like eating Indonesian food out of road-side carts, but they don’t want to sit down and eat it. I don’t know. The key here is, you won’t know until you actually do it. You’ll never know exactly how much need there is, and how many sales you’ll make, until you actually open up shop. But – here’s the the beautiful thing about opening up shop online. All you really need is a domain name, a web site – you don’t even need to create a product initially, but in order to sell, you’ll create a product, put a merchant payment button on it, and start inviting people in that particular niche, and you’re able to see what happens. It’s very, very low entry price to get started online, to test something. Theoretically, you could test something every month, for the next 24 months, until you found the one that worked. Offline, you can’t do that. You can’t go be a plumber for a month and then decide if you want to do it. You can’t then go be an electrician for a month, and then be a chef for a month, then be a mechanic for a month. Takes you a couple of years to learn how to be a plumber. Takes you a couple of years to learn how to be an electrician. You’ve got to put that time, energy and effort into it. Same thing with opening a restaurant, there’s an investment in opening that restaurant. The beautiful thing about online is, you really could try a new niche every single month for 24 months. Until you found one that works. The 7 month period of time. The 7th month, you tried the 7th idea, and it simply worked for you. But, we don’t want to leave you in the dark here. We’ve talked about the fact that we don’t have any fully accurate information that’s just going to point you in the right direction and say, this will work for you. Just like you can look at the 10 restaurants in your downtown area, and see that some are making money, and some are not, you can do the same thing online. You can get clues and signals. You can do research. But in the end, you need to buy the domain name, create the products, and start testing. That’s how you’ll find the winners. That’s how you’ll build a business that makes real money. What are some ways to determine what areas online people are interested in? One way would be to simply go online and go somewhere that there’s a lot of advertising. So, maybe, any of the news websites. A lot of the news websites have classified ads on them. You look at those classified ads, and you look at the topics of those classified ads. You could even take a screenshot of the classified ads today and then a month from now, take another screenshot and see if the same people are advertising. In the advertising world many people advertise once. But, if it fails, they don’t advertise again. The only way to know if advertising works is to buy the advertising. I’ve done it before. I’ve bought advertising before that didn’t work. I only bought it one time. But if I buy it again, and again, and again, and again, you can assume I’m doing one of two things. I’m either trying to throw the competition off, and just trying to get them to all buy the same advertising, so they’ll fall off the cliff. Or, I’m genuinely making money. The truth of the matter is, 99% of the time, when you see advertisers advertising month after month after month. They’re doing it, not because they want to drive their competitors off the cliff, but, because they’re making money. Look at the ads on the big websites (like big news sites) If you take a screenshot today, take a screenshot a month from now, and they’re the same advertisers. You can probably guess, those people are making money. Does that tell us there’s a big demand? It doesn’t tell us anything about demand. What it does tell us is, there are some people making money. Is There Room for More Competition in Your Niche? There’s 2 ways to look at other people making money. One way is, to look at it and say other people are making money, is there room for another entrant? My belief is, there’s always room for another entrant. If! You’re willing to optimize so that you can do things as well as (or better than) somebody else. Some people like to enter markets where there’s very little competition. There’s only 2 or 3 people making money. Because then you can be a big fish in a small pond. The problem with that in today’s marketplace is if there’s only a couple of competitors, there’s probably not a whole lot of demand. That’s not across the board, but it’s a general rule of thumb. There are a few ways to know if your competition is profitable, but many ways to imagine that they might be profitable. For them to actually be profitable is one thing, and for you to figure it out is another. Imagine going into your local pizza shop, and walking up to the proprietor and saying. “Hey, I’m thinking about opening a pizza shop across the street, how many pies are you selling on Friday night?” The guy might call the police and have you arrested for trespassing! He’s not going to give you that information! Well, it’s the same thing online. If someone is genuinely making money in your area of interest they don’t want you, or anybody else, to know. Sometimes folks will do things that make it look like they’re not generating as much revenue as they really are. They don’t want the competition to know. Let’s say a particular company appears to have a market totally locked up, and they’ve got everything figured out. If that’s the case, there are probably unmet needs in that marketplace that the company (or that individual) is not meeting. And, if you can find out what those holes and unmet needs are, you can create a brand new niche all by itself. How do you do that? A great first step is to collect subscribers in your niche – you can run advertising to attract interested prospects in that niche and collect their contact information. Then send an email out asking for their 2-3 biggest problems/questions in the niche. You’ll get a lot of responses and see some overlap. People will also respond with a lot of detail and you can go back and forth with those people. Use these ideas to create products and break into a niche, even a niche where the competition has a tight hold on things. Your market research can help you pinpoint where your market is hanging out online, so you know exactly where to find them and get them onto your list. Then you’re off and running! You could take ALL of the things that I sharing with you, or another coach shares with you, and set up your own shop online, and find it doesn’t work. You could do none of this, and setup your own shop online, and find that whatever it is that you’re trying to sell works. I’m a big believer in just getting out there and doing it to find out what works for you! If you have an interest in a topic, don’t spend the next 12 months trying to figure out if is this the best topic for you. Some people take 2 to 5 years trying to figure out their topic, and by the time they do they find that all the competition has beat them to the market. Instead, get out there today, put up a website, start finding targeted visitors, and just see what happens. You’ll either be successful, or you won’t, and you’ll learn a lot in the process that will be useful in advancing your current business or starting a new one. Fail faster, and fail forward and you will steadily climb the mountain of online success!